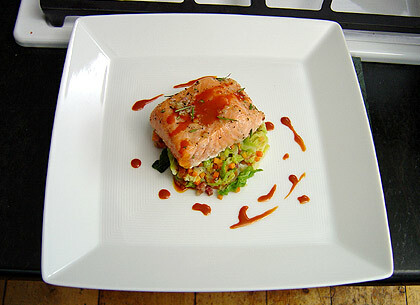 Slow-roasted salmon with melted cabbage, smoked bacon and carrot-juice reduction. Place the bacon in a medium saucepan over medium heat. Render the bacon but do not discard the fat. Add the cabbage and water. Do not season at this point. Cook the cabbage until it is tender, 12 minutes. Meanwhile, place the salmon fillets on a non-stick sheet pan. Drizzle some of the olive oil over the fish. Season with salt, pepper, and half the dill. Top each fillet with a knob of butter and place in the oven for 12 to 15 minutes, depending on how much you like your salmon cooked (12 minutes for medium rare). When the cabbage is soft and tender, season with salt and pepper. Add the crème fraîche and cook over high heat until the cabbage is rich and creamy. Add the carrots to the cabbage and keep warm while salmon continues to cook. Remove the salmon from the oven, and drizzle with the lemon juice. Divide the cabbage between 4 dinner plates, top with the salmon fillets, and drizzle a bit more olive oil over the fish — 1 tablespoon of oil on each fillet and 1/2 tablespoon over the top when it is plated. Season with freshly ground pepper, sprinkled on and around the fish. Spoon some of the carrot reduction around the cabbage and salmon presentation. Reduce the carrot juice by half. Whisk vigorously if the juice separates, then add the remaining ingredients. This segment appears in show #2907.